In 1719 two powerful nobles entered the Red Fort of Delhi and made their way to the presence of King Farrukh Siyar without permission. They accused the king of plotting against them, and he found himself without the power to remind them that he was the king. A few days later their troops dragged him out from his residence like a common thief. Several princesses clung to the intruder's feet, begging mercy for their helpless monarch. Many were raped on the spot, and some prettier ones picked up to entertain Syed Abdullah. He was one of the two nobles who now controlled the Mughal Empire. The other was Syed Husain Ali, his brother. The Syed brothers blinded Farrukh Siyar and threw him into a small underground pit where his only possessions were a bowl, a basin and a flask of water -- bare necessities to relieve himself in the dungeon. While rotting in the stink of his own excreta he kept begging his captors to restore him, earnestly pledging that never again would he go against their will. Meanwhile, the Syed brothers took out a cousin of Farrukh Siyar from the prison and without giving him time to take a bath or change clothes they dumped him on the Peacock Throne, thrusting a precious locket over his prison garments to declare him the king. He was a twenty years lad suffering from consumption. Once secure in their positions as "King-makers", the two brothers killed Farrukh Siyar. Panic hit the people of Delhi, who thought the world would end now because the nobles had stopped respecting their king. Nobody reminded them that their kings had long stopped respecting themselves. The Syed brothers were soon overthrown by a group of royalist nobles. Muhammad Shah quite understood that kings had always ruled through a subsidiary class of elite who controlled the conscience of the people. Under the earlier Mughals, this elite used to consist of the nobles. Typically, a noble was a man of arms with excellent administrative qualities. Under Aurangzeb, the power of the nobles was diluted by the rise of a religious elite who established a virtual monopoly over people's souls. The new religious elite was represented by the qazis, muftis, preachers and countless prayer-leaders whom Aurangzeb established throughout his empire. Muhammad Shah naturally distrusted the nobles since he had seen the case of the Syed Brothers. On the other hand he had no patience for the men of religion because his soul thrived on wine, poetry and music -- all declared illegal by the men of religion. He created a new class of elite, the men of art and literature. Poets, painters and musicians had thronged the courts of the earlier Mughals but they had always been regarded as mere entertainers. Muhammad Shah elevated them to the status of elite and a new class was thus created. This was the intellectual elite. To this class belonged such later celebrities as Mir, Sauda and Ghalib. The typical gentleman of Old Delhi, with a suitable wealth to live by and spending most of his time in writing or listening to poetry, which remains in our imagination the emblem of the Indian Muslim nobility, never existed in the days of the greater Mughals. Muhammad Shah Rangeela alone founded this culture. In doing so, he obviously displaced the power of the militant nobles. Most Mughal historians belonged to the class of the militant nobility, and hence they either painted him as a monster of sloth, or simply ignored him as a pleasure loving escapist. In reality he was more of a realist that his accusers, perhaps the first pragmatist in the House of Taimur since Shahjehan. Out of the ashes of the Mughal Empire, Muhammad Shah created a Delhi that was a city of culture. The middle and upper classes were marked with an easy going attitude with a high value placed on etiquette and courtesy. Even in the realm of music, the classical dhurpad was replaced with the easier one, khayal. The elegant Persian language gave way to Urdu, the language of the commoner, now adopted by the elite for the first time. The general atmosphere was liberal, though also licentious. It was the Delhi of Muhammad Shah that Mir Taqi Mir recalled a generation later with pride and nostalgia, "Dehli jo eik shehr tha alam mien intikhab..."
It is said that Nizamul Mulk, the viceroy of Deccan who was among the brave and loyal nobles who had defeated the Syed Brothers, advised the king to interfere in the civil war of Persia. The Safavi dynasty of Persia, who had helped Humayun regain his empire, was now in great peril from the Afghan invaders. Nizamul Mulk reminded the king that this was a time to repay the generosity of the Safavis by sending an army to assist them in Persia. He was obviously overlooking the fact that to give such an order to an army whose average speed was two miles a day in own territory was to sign their death warrants. Muhammad Shah politely reminded Nizamul Mulk that the Mughal army was in no position to undertake such an operation. Nizamul Mulk then brought up three other suggestions, including the proposal to re-impose jiziya on the Hindus. In Nizamul Mulk we have the first prototype of the Indo-Pakistani Muslim fundamentalist -- his head held high with dreams of a past glory and heart filled with the belief that military solution is the only way to set the world right. He never has the time to look at his non-existent resources. Against him, Muhammad Shah is the other prototype coming out of the same decadent society. This is the worldly wise person whose choices are based on the limited available resources but who never bothers thinking about increasing the choices by looking for newer resources. Both these prototypes have made a comeback in our society, and quite often we meet people who are a hybrid of both. They live by the principles of the merrymaker but their sympathies follow the fundamentalist. Obviously, this hypocrisy comes from the misplaced religiosity cultivated by Aurangzeb and kept alive by the institution of the religious elite which is now making another bid for the power and privileges it enjoyed during the days of its feudal lord. The resources available to the Mughal king were no longer sufficient to keep an empire stretching from Kabul to Bengal. Muhammad Shah adopted a policy of peaceful withdrawal. It seems that he had demarcated a reasonable territory around Delhi as his actual kingdom. This he protected efficiently, personally leading his army against any aggressor who threatened peace in the region, and generously forgiving his enemies once they were overpowered. The rest of his empire he let go. Bengal, Oudh, Deccan, South India and Kabul broke away from the Mughal empire during this period (1719 - 48). All empires end, but the Mughal Empire broke up with a magnanimous gesture that was symmetrical to its bygone glory. There was no bloodshed, and the new states remembered their former Mughal Masters with love, reverence and pride. That was more than what Lord Mountbatten could achieve for his British Empire two centuries later. The most unfortunate incident of Muhammad Shah's reign was the invasion of Nadir Shah, the King of Iran. Nadir started as an unscrupulous robber but emerged as a patriot against the Afghan invaders. He assumed the crown by deposing the last of the Safavi rulers. He then captured Kabul, which was a part of the Mughal empire until then. Nadir justified his move by claiming that many Afghans were taking refuge from persecution by feeling to Kabul. Muhammad Shah couldn't have bothered, for Kabul yielded less revenue than the money spent on its maintenance so that extra expenses had to be met from the revenue of some lands near Delhi. Nadir now claimed that those lands should also be handed over to him! It is said that when a messenger brought news to Muhammad Shah about Nadir's advances in the Frontier and Punjab, he dipped the letter into his cup of wine, reciting the famous verse from Hafiz: Ein daftar-e-bemaana gharq-e-mae naab oola! (This meaningless account better be drowned in neat wine!). There is no way we can verify this story, which is inconsistent with Muhammad Shah's typical behavior on such occasions. Upon hearing the news of a far-off province taken away he would usually retreat into a garden and spend a few hours in flower gazing with a gloomy look on his face. But then, again, consistency is not a virtue to be found in those who represent a decadent society. Illusion of power, if power is lacking, could be a dangerous thing. Someone in Delhi spread the rumor that Nadir was assassinated and the mindless population killed three thousand of his soldiers who were shopping carelessly in the bazaars. Enraged, Nadir ordered his soldiers to kill as many Indians as they could, much like Tamerlane had ordered his soldiers in Isfahan. After nine hours of carnage Nizamul Mulk approached the furious invader and recited a Persian couplet, meaning that there isn't a single soul left for you to kill with the sword of your coquetry, unless you bring them back to life and kill them again! The choice of words impressed Nadir, and he sheathed his sword in a gesture for his soldiers to stop the killings. It is estimated that Nadir took away with him treasures worth as much as seven hundred million rupees. That included the famous Peacock Throne of Shahjehan while Muhammad Shah was also forced to marry his daughter to Nadir's son. The human drama enacted between Nadir and Muhammad Shah is a powerful interplay of opposing social currents and defines the limitations of decadent sophistication in the face of brute force. It also completes a cycle in the story of The House of Taimur. The story of the Mughal dynasty had opened with the barbarity of Taimur, who had invaded, plundered and destroyed highly sophisticated but powerless civilizations. It closed with the invasion of a man who was so much like Taimur himself, and to him the descendants of Taimur forfeited everything they had inherited -- wealth, courage and prestige. A testimony to Muhammad Shah's acumen is found in one of the archives in Turkey, which shows that after Nadir Shah's return he sent an embassy to the Ottoman Turks, the traditional enemies of the Persians. He urged the Turk Sultan to maintain his pressure on the Persian King. And yet, the sanctimonious critics of Muhammad Shah can't resist covering up the last years of his reign by saying that he resumed his pursuit of decadent sophistries after Nadir went back. If he did so, he did well. Because that kept him alive and in good spirits to stop Nadir's successor Ahmed Shah Abdali in April 1748. Abdali invaded in the hope of repeating the same old-fashioned thing in Delhi. 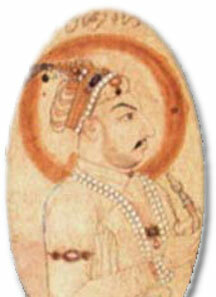 His hopes were checked by the Mughal army, which was led by the king's son (also named Ahmed Shah). Muhammad Shah himself was too ill to leave his capital. He died just after receiving the news that his son had inflicted a crushing defeat on Abdali. Out of the ashes of the Mughal Empire, Muhammad Shah created a Delhi that was a city of culture.